Many iPhone applications are entering their second (or third) generations, bringing new coats of polish and all the knowledge gained from surviving adolescence. BuddyFeed 2.0, a client for the media sharing service FriendFeed, is a great example of an application that improved with age. For those who have yet to sign up, FriendFeed is a deceptively simple service that carries a variety of monickers from “lifestream” to “microblog.” It allows you to import activity from services and communities like Flickr, Blogger, YouTube, Twitter, Delicious, and nearly 60 more. You can also blog and upload photos or videos directly to FriendFeed, then give friends and family one single address at which to check out all of your adventures online (such as FriendFeed.com/chartier). With the addition of built-in comments and topic-centric “Rooms” in which you can share media and meet like-minded users, FriendFeed is an all-out assault on any productive time still left in your day. 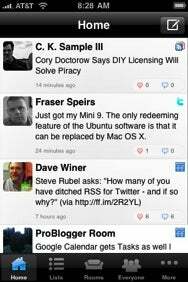 BuddyFeed, from CodeWalrus, packages FriendFeed for the iPhone and iPod touch and with version 2.0 it has indeed grown wiser and more mature. The UI has been redesigned to offer much faster access to your rooms, your friends’ streams, search, and lists, which are collections into which you can manually sort friends, coworkers, and other users in order to help manage your signal-to-noise ratio. The new toolbar containing these buttons is also customizable, much like in the iPhone OS’s iPod app. New settings offer more control over various FriendFeed browsing behavior, and, of course, a round of bug fixes provide a smoother ride. All of the FriendFeed-specific features are still here, including commenting on FriendFeed entries and marking posts as "liked" as a sort of hat-tip to the poster. With this new version, BuddyFeed’s price has increased from $1 to $3. For aspiring and avid FriendFeed users, though, it’s still worth the price. Despite still lacking a few key features (such as e-mailing a link to FriendFeed entries and sending links or syndicating posts to Twitter), BuddyFeed 2.0 puts an even better FriendFeed experience in your pocket.